This may not be the most polite thing to say in the wake of the MoCo Democrats’ Kiss and Make Up Party, but it’s the truth: MoCo Dems are badly divided. Consider the following. The photo finish in the Executive race between Marc Elrich and David Blair is exacerbated by the fact that many Democratic activists are part of Anybody But Elrich or Anybody But Blair factions. No matter who wins, that person will have 29% of the primary vote, far lower than any prior MoCo Executive. That’s not the only divide in the Executive race. The three incumbent Council Members received a combined 52% of the vote. The three outsiders received 48%. That suggests an even split between those who want more of what they have seen from the council and those who want something different. Gubernatorial candidate Ben Jealous won MoCo with roughly 36% of the vote, four points ahead of Rushern Baker and 22 points ahead of MoCo State Senator Rich Madaleno. No one wants to talk about this publicly, but there are quite a few county Dems out there who will consider voting for Governor Larry Hogan. Now Nancy Floreen has filed a declaration of intent to run for County Executive as an independent. This is sure to attract the attention of some Dems who are upset that the nine-member County Council will include just one woman. Floreen is one of the most prominent female Democrats in the county’s history. No woman has been elected countywide more times than Floreen since charter government was established in 1970. If she does indeed get on the ballot, a not-insignificant number of Dems – especially women – could vote for her. All of this adds to county Democrats’ pre-existing divide about land use, the Upcounty vs Downcounty split, long-standing tensions between progressives and moderates and the Hillary vs Bernie disputes of two years ago (and the Hillary vs Obama disputes before that). Throw that in with the fact that a majority of Democrats voted for term limits and there’s a lot of bubbling in the cauldron right now. The county’s two most popular Democrats are U.S. Senator Chris Van Hollen and Congressman Jamie Raskin. Neither is known for intervening in and settling local disputes. County Executive Ike Leggett is widely respected but is leaving office. The Governor is a Republican who is happy to see Dems fight Dems. As for the Republicans, they must be kicking themselves that they couldn’t find anyone else to run for Executive other than Robin Ficker. Your author has written over a thousand posts over the last decade about state and local politics. Some of those posts were tough. Some called out elected officials by name and others took strong positions on issues that were unpopular with some. 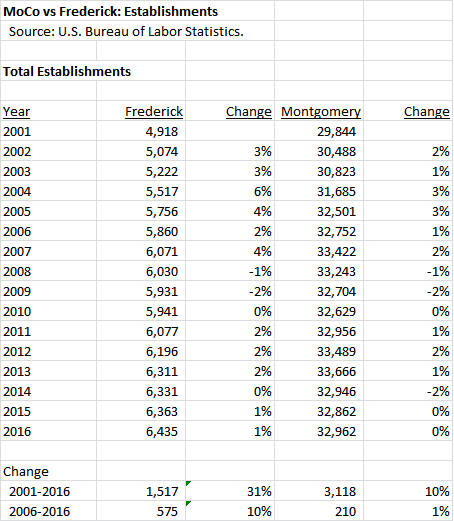 But none of them provoked a more negative reaction from the political establishment in Rockville than our three recent posts on the history of MCPS funding. Those posts did not contain ad hominem attacks. They relied on budget data to make a point: the county restricted local funding for public schools for seven straight years and relied on state aid to fund the school system until property taxes were raised last year. We then recommended that the school system get small, steady per pupil increases to deal with their needs financed by restraint in the rest of the budget. This was not enjoyed by the officialdom in Rockville. Terms were used like “misleading,” “distortions,” and “over the top.” But in the end, the response from Council Member Nancy Floreen wound up confirming, not refuting, much of what we wrote. There is no real disagreement over the facts of the matter; the budget data tells the same story no matter how it is read. There is only disagreement over how those facts are characterized. All of this provokes a thought. Everyone reading this post has suffered a huge defeat at some point in their lives. What does one do? Well, after regaining consciousness and asking, “What the hell happened?” many people try to reconstruct what led to the defeat and assess the various factors that contributed to it, including self-inflicted wounds. Then a resolution is made to avoid repeating those mistakes in the future. Sure, we often mess up again. But sometimes we learn and improve. For the Rockville political establishment, the 40-point passage of term limits was that moment of huge defeat. It was the biggest voter revolt since two consecutive County Councils were thrown out in the 1960s. Where is the self-reflection and soul searching in the wake of that moment? We’d like to see someone in government say, “Here’s what we learned from term limits. Here’s what will be different going forward.” Anyone who does that would deserve great respect. Your author speaks regularly to candidates who knock on doors. There is considerable diversity in the views of the voters. Development is one issue provoking different opinions. “We need more jobs.” “We are overdeveloped.” “We need more affordable housing which is why we need to stop all this building!” (Yes folks, that was an actual quote from a MoCo voter!) But there is also a bit of unease. “My kid’s school is crowded.” “I pay more in taxes but I’m not getting more in return.” “I’m having problems affording the cost of living here and I’m worried that my kids won’t be able to afford to live here.” “The county doesn’t listen to me.” These are not tea partiers or Trump supporters; these are Democrats who regularly vote. This isn’t hatred of incumbents. But lots of folks are asking the same question. Where are we going? The interest groups in the county are asking the same thing. None of them feels content. The business community, the labor folks, the PTAs, the Realtors, the civic community and the rest of them are all uneasy and some are downright unhappy. They have more in common than they believe. What happens when they start talking to each other? The 2018 election will not be a normal event. It occurs in the context of a stagnant economy, a school system in desperate need, a tight budget, abject failures in the White House and Capitol Hill and voter rejection of the status quo. We haven’t seen anything like this in decades. The good news is that the candidate field is outstanding. Some of the incumbents have tremendous experience and substantial achievements in their records. All of them who were in office in 2010 can claim credit for saving the county from complete fiscal disaster. The non-incumbents are smart, energetic, diverse and gifted in life experience. Many of them would make great elected officials. But we need something more. We need to ask: where are we going? And where should we be going? To do that, we have to honestly assess where we’ve been – even if it means breaking a few eggs – and then figure out how to move forward. It’s not easy. As the incumbents will tell you, the constraints are real. Do you want to give more money to the public schools? Fine – then understand the state’s maintenance of effort law and be prepared to raise taxes or control spending elsewhere in the budget. Do you want to improve the economy? Fine – then avoid increasing the difficulty of doing business in the county, especially when it comes to employer costs and predictability. Do you want to increase incomes? Fine – that involves a discussion of rebuilding the working and middle classes through encouraging collective bargaining. Do you want to increase funding for school construction? Fine – then you need to find new revenue or be prepared to restrain the rest of the capital budget. Do you want to help immigrants and people of color? Fine – then be attentive to the needs of small businesses, which in this county are dominated by owners who are immigrants and people of color. Do you want to close the achievement gap? Fine – get ready for some difficult discussions about housing policy. We could go on and on. These discussions are necessary for us to move forward. They must be honest. They must be driven by data, not ideology. And they must not spare political sacred cows. Because if we don’t figure out where we are going, we will wind up in one place. With the early vote already counted in Montgomery County, terms limits is now leading by 64% to 36%. At the same time, the Council’s amendment to not count Nancy Navarro’s partial term is also currently ahead by 80% to 20%. Part Two presented a host of demographic data comparing Democrats who voted in all three of the 2006, 2010 and 2014 primaries (“Super Dems”) to voters from all parties who voted in both of the 2008 and 2012 general elections (“Super Generals.”) Let’s compare the two groups more concisely below. Be age 29 or younger. Live in Council District 2. Live in Legislative District 39. Live in precincts that are 25% or more Asian. Live in Legislative District 15. Be age 80 or older. Live in Legislative District 20. Live in Legislative District 18. Live in Council District 5. The above items are ranked in order of likelihood. So for example, the biggest difference between the two electorates is in age, but that is far from the only difference. Super Dems are mostly from Downcounty, tend to be seniors or close to it, have a lot of voting history and may be majority liberal. They elect MoCo’s county officials and state lawmakers, who tend to be responsive to them. Super Generals are geographically diverse, younger in age, have less voting history and are much more diverse ideologically. Liberals probably do not account for a majority of Super Generals. It is the Super Generals, not the Super Dems, who decide charter amendments and ballot questions, including this year’s amendment on term limits. Two more facts are relevant to Super Generals. First, on the last three major county ballot questions, the general electorate voted in favor of stricter limits on property tax hikes, against the ambulance fee and against broad collective bargaining rights for the police union. These were arguably the less progressive positions on all three questions. If these questions were submitted only to Democratic primary voters, they may all have had different outcomes. Second, a Washington Post poll in September found that MoCo voters from all parties together gave Governor Larry Hogan a 66% job approval rating. This was not significantly different from the Governor’s statewide approval rating of 71%. 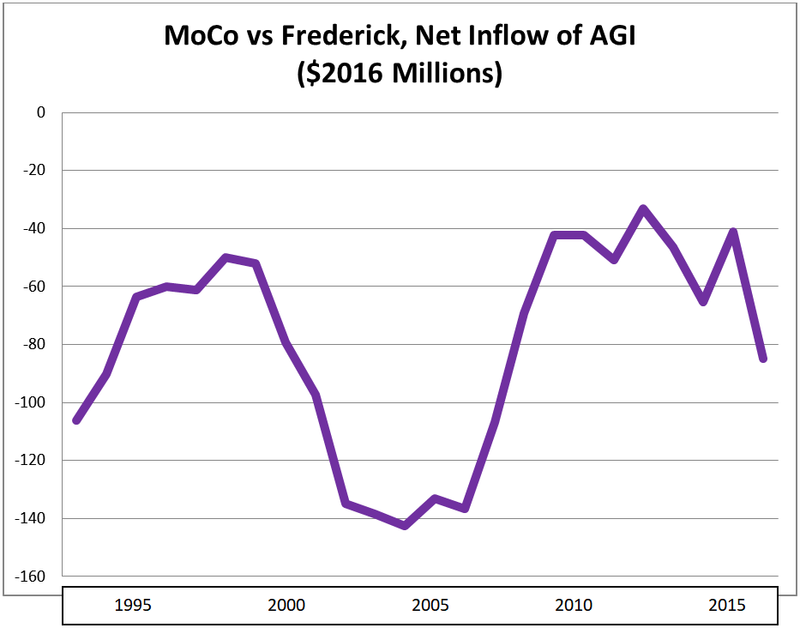 It’s hard to imagine a majority progressive electorate approving of an anti-tax GOP Governor to that extent, but this is further evidence that liberals may not in fact be a majority of MoCo voters. Term limits is the issue of the day and will be decided soon enough. But a broader question looms. 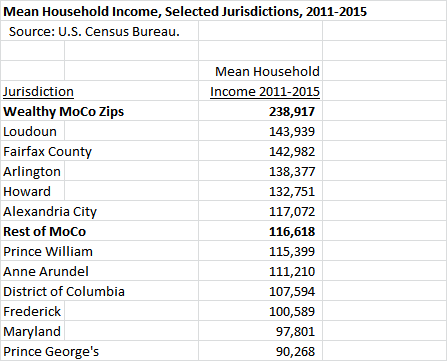 Given the differences between MoCo’s Two Electorates, what happens when elected officials cater to one of them at the heavy expense of the other? The recent large property tax hike, which was spread all across county government, was aimed at the priorities of liberal Democratic voters. It also became the core of the push for term limits which is aimed at the general electorate. This suggests a need for balance and restraint by those running the government. Because if one of the two electorates feels unheeded, either one has the tools to strike back – either by unseating incumbents or by shackling them with more ballot questions and charter amendments. In Part One, we began contrasting MoCo’s Two Electorates: namely, the Democratic primary voters who pick our elected officials, and the general election voters who decide charter amendments and ballot questions. 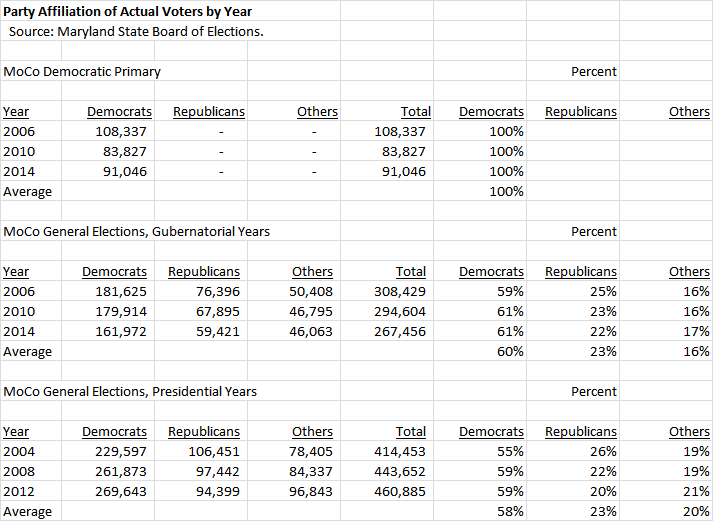 Today we present new data on the two electorates from the voter file. We have integrated the January 2015 voter file available from the county’s Board of Elections with a variety of U.S. Census demographic data to analyze two groups of MoCo voters. The first group, whom we call “Super Dems,” are those Democrats who voted in all three of the county’s 2006, 2010 and 2014 primaries. The second group, whom we call “Super Generals,” are those voters from all parties who voted in both the 2008 and 2012 presidential general elections. We would have also included 2004 voters if we could have, but the voter file doesn’t go back that far. Presidential general election voters are relevant to this year, which is also a presidential year in which term limits are on the ballot. Let’s look at a few demographics for Super Dems and Super Generals. Super Dems are, of course, 100% Democrats. Super Generals are 60% Democratic, 21% Republican and 18% others (most unaffiliated voters). This matches the distribution of general election votes referenced in Part One. Both groups are majority female, with women being a slightly higher share of Super Dems. Super Dems skew towards seniors, with an average age of 64. Super Generals are much more diverse on this measure, with an average age of 55. While 19% of Super Generals are below age 40, only 3% of Super Dems are. And while 63% of Super Dems are age 60 or older, only 39% of Super Generals are. This means that while young voters are a meaningful voting bloc in general elections, they generally are not in MoCo Democratic primaries. 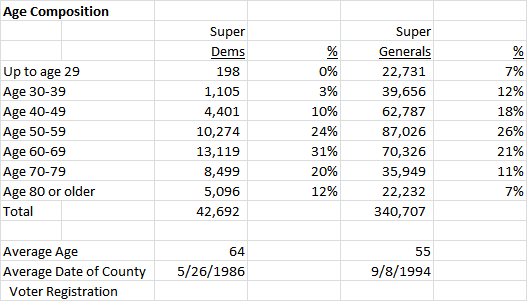 The difference in average date of voter registration in the county further emphasizes the deeper roots Super Dems have in MoCo than Super Generals. This is not a significant differentiator between the two groups, although this data masks real differences in residence geography. This is also not a significant differentiator. Both groups overwhelmingly live in single family homes and a big majority of them are probably home owners. 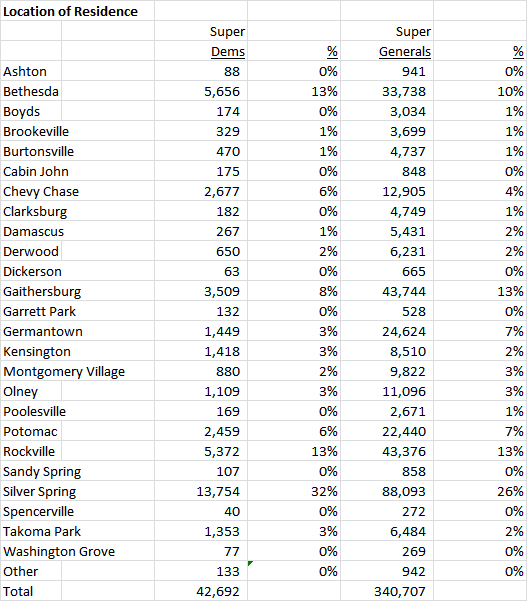 Super Dems are more likely to live in Downcounty locations like Takoma Park, Chevy Chase, Bethesda, Kensington and Silver Spring while Super Generals are more spread out, including in Upcounty communities like Clarksburg, Damascus, Germantown and Montgomery Village. This has ideological implications. In this year’s Congressional District 8 primary, the very progressive Jamie Raskin ran up his biggest margins inside and near the Beltway, while the more moderate David Trone did best in northern areas. Once again, the geographic split between the two groups is obvious. Fifty-four percent of Super Dems can be found in the two liberal strongholds of Council Districts 1 and 5, while Super Generals are more geographically balanced. 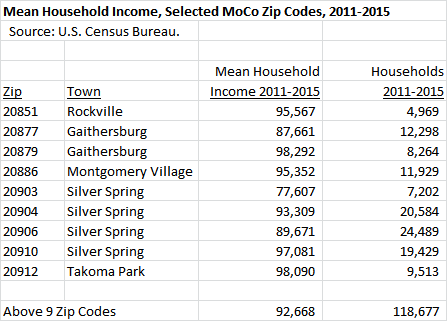 This may help explain why three of four At-Large Council Members come from Takoma Park. Race and ethnicity are not available from voter registration data, but we can examine those factors for the precincts in which voters live. 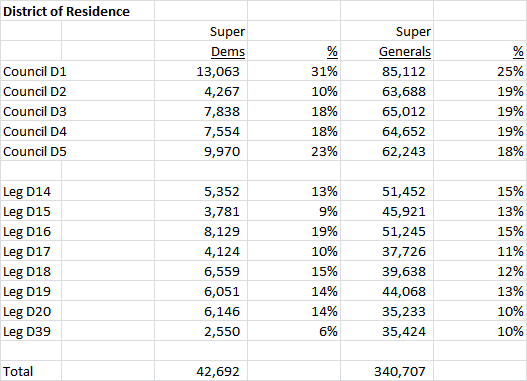 By this measure, Super Generals appear to be slightly more diverse than Super Dems. This suggests a need for more outreach to people of color by the Democratic Party, which should be their natural home. We will conclude in Part Three. Montgomery County voters are some of the most progressive people in the nation. They elect only Democrats, and almost all very liberal ones. They celebrate diversity and respect civil rights. They support a large, active government that passes liberal laws, provides excellent schools and generous social services and has extensive environmental programs. Perhaps most importantly, they are willing to pay the taxes that support all of this. Is the above a true statement? Yes. And maybe no. It all depends on which electorate you’re talking about. Montgomery County has two of them. The first electorate is comprised of those Democrats who vote in the closed primaries for County Executive, County Council and members of the General Assembly. Many of these are liberals who vote for candidates with similar views. Indeed, there is an old aphorism that it’s nearly impossible to run too far to the left in MoCo elections. Most elected officials here regard these voters as their political base and tend to be highly responsive to them. But there is a second electorate: those residents who vote in general elections. These voters come from all political parties and have significant ideological diversity. For the most part, they tend not to reject the nominees of the Democratic Party for local and state office. (The last Republican elected officials here were defeated ten years ago.) But they can and do weigh in on charter amendments and ballot questions, and they do not always behave in accordance with the county’s progressive reputation. This blog series examines the differences between these two electorates on the eve of the general election, when a landmark ballot question on term limits will be decided. Of the two electorates, only one – the general election voters – will decide whether term limits will pass. First, we examine the party composition of the two electorates. The Democratic primary voters are of course 100% Democrats since Maryland uses closed primaries. The general election voters are roughly 60% Democratic, slightly more than 20% Republican and slightly less than 20% unaffiliated or members of other parties. Are liberals a majority of the general electorate? That’s hard to say, but a little math can help. If just a fifth of the Democrats, who comprise 60% of general election voters, are not liberals, then a majority of the general electorate would probably not be liberal. (There are a handful of Green Party members in MoCo, but not enough to change the basic math here.) So while a majority of Democratic primary voters may be liberal, it’s difficult to apply that characterization to the entire electorate. Another factor that can be easily seen from the data above is the relative size of the electorates. There are about three times as many voters in gubernatorial general elections as there are in gubernatorial Democratic primaries. Presidential general election voters outnumber gubernatorial primary Democrats by five to one. So while Democratic primary voters pick our elected officials, the presidential general voters are a much closer gauge of the political sentiments of the entire community. 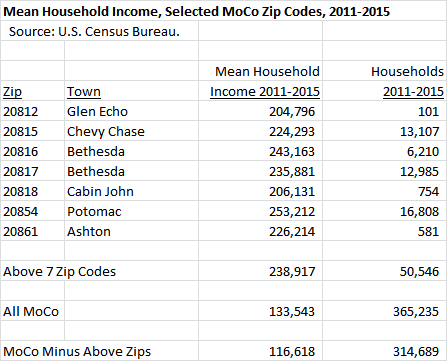 We will begin contrasting MoCo’s two electorates in Part Two.